I videotaped this concert when it aired on PBS decades ago and have been watching it periodically ever since. Every time I see it, I ask myself the same question: Why on earth has this incredible show—which has long been available on CD—never been issued on DVD? As I discovered a while back, I wasn’t alone in my bewilderment: just look at the show’s page on Amazon, which originally touted the now-long-discontinued VHS version. Well, finally, after more than 20 years, Sony is indeed listening, though it turns out the label wasn’t the main holdup: it apparently took all this time to cut through red tape with Japan’s public-television network, NHK, which owned the only high-definition video recording of the event. 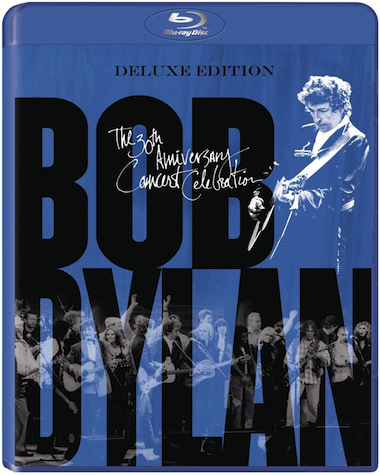 The October 16, 1992 concert—held in New York at a sold-out Madison Square Garden to mark the 30th anniversary of the release of Bob Dylan’s eponymous debut album—is being released March 4 on DVD and Blu-ray. Both editions feature remastered sound (albeit just stereo, no 5.1 mix) and excellent widescreen video, and both showcase spirited readings of 29 songs from a wide assortment of musical luminaries. Also here are several fine bonus performances, two of which weren’t on the original VHS/Laserdisc version, and about 40 minutes of previously unseen backstage video, including snippets from rehearsals and brief but noteworthy interviews with such artists as Lou Reed, Rosanne Cash and Eddie Vedder. (None of these extras are in widescreen format, unfortunately.) Those who witnessed the original concert are about to be rewarded for their long wait for a DVD or Blu-ray. Those who haven’t seen it are about to find out what all the fuss was about. This is simply one of the best multi-artist rock concerts ever presented. One reason is the classics-packed program, which consists entirely of Dylan compositions (with one exception, which I’ll get to presently). Another is the well-chosen lineup of artists, all of whom had worked with Dylan, jumpstarted their careers with versions of his songs or simply been influenced heavily by him. Clearly, these musicians felt a debt to the man; and virtually all seem determined to say thanks by delivering knockout performances. It probably helps that the songs they offer tend to be their personal favorites. As I mentioned, the program includes one non-Dylan track. Sinead O’Connor had intended to perform “I Believe in You,” an often-overlooked gem from Slow Train Coming; but the audience booed her when she came onstage, an apparent response to a Saturday Night Live appearance a few days earlier, during which she’d torn up a picture of the Pope as a protest. At the Dylan show, a visibly shaken O’Connor paused for a long time while the audience ranted; then she responded with a spontaneous and defiant a cappella reading of Bob Marley’s “War,” walked offstage and burst into tears in the arms of Kris Kristofferson. The DVD/Blu-ray runs about three hours, but the show lasted a third longer. Missing here are more than half a dozen tunes, some of which were featured in the original 1992 pay-per-view live broadcast and subsequent PBS special. That’s unfortunate, because the omitted material includes some noteworthy performances—Sophie B. Hawkins’s take on “I Want You,” George Harrison’s reading of “If Not for You” and Dylan’s performance of “Song to Woody,” to name a few. Even the full concert program, of course, barely scratches the surface of Dylan’s incredible songbook. The show includes no “Desolation Row,” no “Dear Landlord,” no “A Hard Rain’s a-Gonna Fall,” no “Positively 4th Street.” Hell, there’s nothing at all from Blood on the Tracks. A few key performers are missing too. Where, for example, are Scarlett Rivera and Ramblin’ Jack Elliott, not to mention Bruce Springsteen? And where, oh where, is Joan Baez? I’ve read unconfirmed reports that she performed, but she’s not on this or any other available versions of the show. No matter. Even if you’re not quite the Dylan fan I am, the best of what this video does include will likely knock your socks off. Buy it now. Better yet, buy two copies and put one in a safe-deposit box. You won’t want to be caught empty-handed if something should happen to copy No. 1.